Amongst the swarm of eating joints in Khan Market is debutante Barcelos which opened on 26th February, 2015 under Mr. Costa Maziz. It is situated opposite Café Turtle and is adjacent to the Chinese restaurant Soy, so locating it is not at all a problem. Like the other restaurants in this area, Barcelos too is situated atop a narrow staircase. Delhi has a lot of options for Italian and other such cuisines but this restaurant promises a completely different experience by bringing the Afro-Portuguese cuisine to your plate at a reasonable cost. The food chain which began in 1993 in South Africa has now a strong foothold in over 17 countries and continues to spread its charm worldwide. Barcelos is named after a Portuguese town. The logo of this franchise is a red rooster which can be seen on the headboard, the dips bottles and even on the miniature flags stuck on the burgers. It is also a famous symbol in this Portugal town. It is called o galo de Barcelos (the rooster of Barcelos). Legend has it that once a pilgrim was accused of stealing from a wealthy landowner. He was sent to court where the judge sentenced him to death despite his repeated protests of innocence. The judge was about to eat a rooster at that time when the pilgrim, as a last attempt to save himself said, “if I am innocent, the rooster will begin to crow”. Just when the piligrim was about to be hung, the rooster started crowing and he was set free. The ambience is good. Walls are covered with maps, making it look like a scene out of geography class. Potted plants lend a very naturalistic feel. The interiors are quite simple, nothing out of the world as such. The food is presented well and the quantity is quite generous. The most popular dish here is the Black Burger. The black buns are prepared from some special herbs and permissible food colour in the U.S.A. The bun does not taste any different from the other regular ones, it’s just the colour that makes it special. The Chicken Black Burger has a huge and well marinated chicken fillet, lettuce and tomatoes. It is a delicious treat for the soul. The staff notes down your spice preference and makes the burger accordingly. Chicken Picantte is a dish of chicken breast grilled with Peri Peri sauce. Perhaps one of the best grilled chicken I have had; neither very soft nor very hard. It is served with a bowl of Coleslaw or any other side dish of your choice from the menu, and potato wedges. The coleslaw is prepared exceedingly well. The Vegetarian Trinchado was a dish of yellow rice served with a bowl of vegetable gravy consisting of bell peppers, onions, tomatoes and paneer. The rice had a lemony flavor. 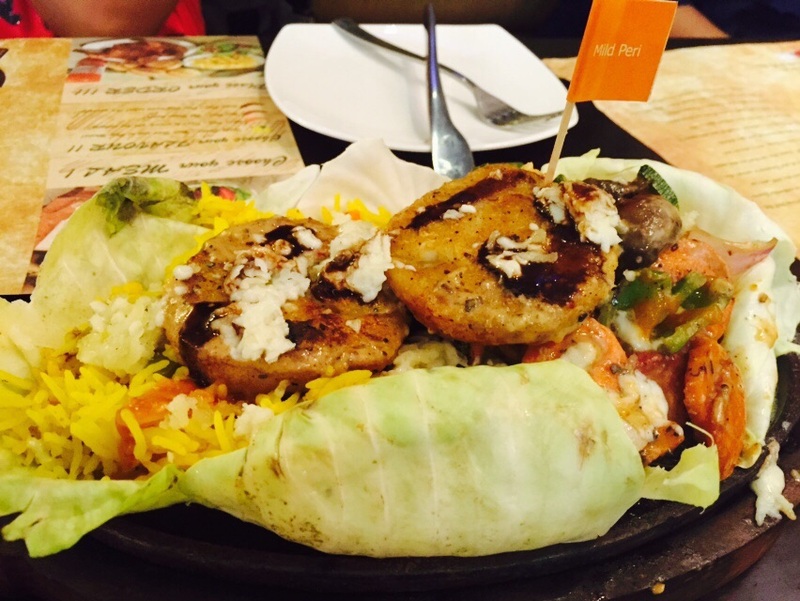 Vegetarian sizzler came with spicy rice, grilled vegetables and potato cutlets in a smoky avatar. Amongst the mocktails, Minty Balst is a refreshing cooler. It’s like a semi-frozen version of the regular mojito. The staff is very courteous and service is quite prompt. They take care of individual spice preferences. African music plays in the background but it’s a bit too loud making it a little difficult to hold conversations. Also they could probably play some popular songs in between which would make the crowd feel at home. “There are a lot of Italian, Chinese and Mexican food joints in the city. Barcelos introduces a completely different range of flavours. 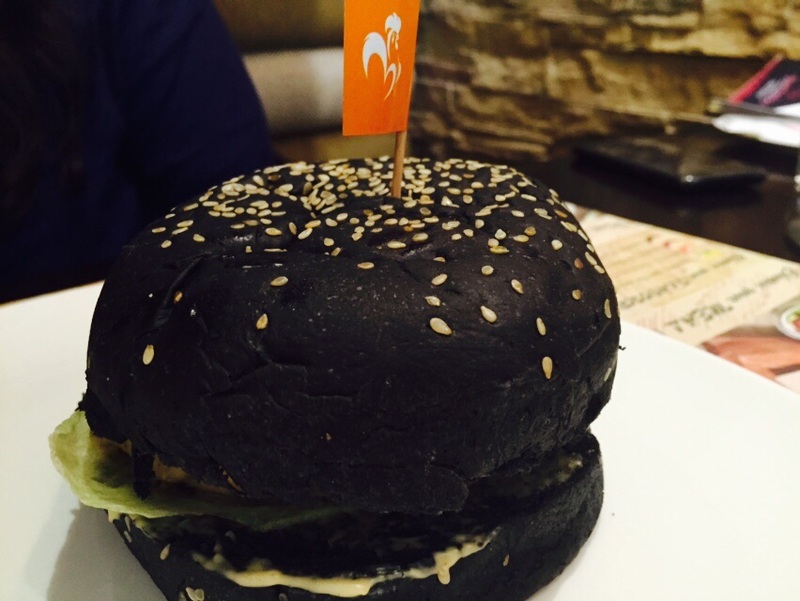 The Black Burger is just one of the many surprises that we have in store for our customers. We will be introducing new dishes after a span of every 3-4 months”, says Mr. Kuldeep, manager of the Khan Market outlet. The franchise is expected to expand itself as they hope to open about 8-10 branches by the end of 2015. With its authentic cuisine and gastronomic delicacies, it seems like Barcelos is here to stay!